Gymnastics is a sport involving the performance of sequences of movements requiring physical strength, flexibility, balance, endurance, gracefulness, and kinesthetic awareness, such as handsprings, handstands, split leaps, aerials and cartwheels. Gymnastics evolved from beauty practices and fitness regimes used by the ancient Greeks, including skills for mounting and dismounting a horse, and circus performance skills. Since its entrance into the United States in 1830, it has rapidly evolved into a perennial Olympic sport. Gymnastics is a sport that harmonizes body movement to the lilting tunes of choreographed music, very much like a form of art. Gymnastics events test the strength, rhythm, balance, flexibility and agility of the gymnast, demanding an intense level of self-discipline. The history of gymnastics dates back several thousand years ago, to the Greek civilization. The word gymnastics comes from the ancient Greek word "gymnos" meaning naked. To the Ancient Greeks, physical fitness was paramount, and all Greek cities had a gymnasia, a courtyard for jumping, running, and wrestling. As the Roman Empire ascended, Greek gymnastics gave way to military training. The ancient Romans, for example, introduced the wooden horse. In 393 C.E. the Emperor Theodosius abolished the Olympic Games, which by then had become corrupt, and gymnastics, along with other sports declined. Later, Christianity, with its medieval belief in the base nature of the human body, had a deleterious effect on gymnastics. For centuries, gymnastics was all but forgotten. In the late eighteenth and early nineteenth centuries, however, two pioneer physical educators – Johann Friedrich GutsMuth (1759 – 1839) and Friedrich Ludwig Jahn (1778 – 1852), considered the father of modern gymnastics - created exercises for boys and young men on apparatus they designed that ultimately led to what is considered modern gymnastics. In particular, Jahn crafted early models of the horizontal bar, the parallel bars (from a horizontal ladder with the rungs removed), and the vaulting horse. By the end of the nineteenth century, men's gymnastics competition was popular enough to be included in the first "modern" Olympic Games in 1896. However, from then, and up until the early 1950s, both national and international competitions involved a changing variety of exercises gathered under the rubric gymnastics that would seem strange to today's audiences: synchronized team floor calisthenics, rope climbing, high jumping, running, horizontal ladder, etc. During the 1920s, women organized and participated in gymnastics events, and the first women's Olympic competition – primitive, for it involved only synchronized calisthenics - was held at the 1928 Games in Amsterdam. By the 1954 Olympic Games, apparatus and events for both men and women had been standardized in modern format, and uniform grading structures (including a point system from 1 to 10) had been agreed upon. At this time, Soviet gymnasts astounded the world with highly disciplined and difficult performances, setting a precedent that continues to inspire. The new medium of television helped publicize and initiate a modern age of gymnastics. Both men's and women's gymnastics now attract considerable international interest, and excellent gymnasts can be found on every continent. Nadia Comaneci received the first perfect score, at the 1976 Olympic Games held in Montreal, Canada. She was coached by the famous Romanian, Bela Karolyi. According to Sports Illustrated, Comaneci scored four of her perfect tens on the uneven bars, two on the balance beam and one in the floor exercise. Unfortunately, even with Nadia's perfect scores, the Romanians lost the gold medal to the Soviets. Nadia will always be remembered as "a fourteen year old, ponytailed little girl" who showed the world that perfection could be achieved. In 2006, a new points system was put into play. Instead of being marked 1 to 10, the gymnast's start value depends on the difficulty rating of the exercise routine. Also, the deductions became higher: before the new point system developed, the deduction for a fall was 0.5, and now it is 0.8. The motivation for a new point system was to decrease the chance of gymnasts getting a perfect score. Artistic Gymnastics is usually divided into Men's and Women's Gymnastics, with each doing a different rotation of events; Men compete on Floor Exercise, Pommel Horse, Still Rings, Vault, Parallel Bars, and High Bar, while women compete on Vault, Uneven Bars, Balance Beam, and Floor Exercise. In some countries, women at one time competed on the rings, high bar, and parallel bars (for example, in the 1950s in the USSR). Though routines performed on each event may be short, they are physically exhausting and push the gymnast's strength, flexibility, endurance and awareness to the limit. Traditionally, at the international level, competitions on the various apparatus consisted of two different performance categories: compulsory and optional. For the compulsory event, each gymnast performing on a specific apparatus executes the same required routine. 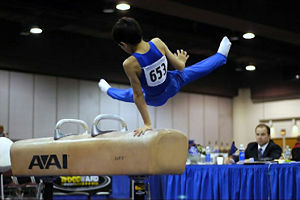 At the optional level, the gymnast performed routines that he or she choreographed. Currently, each country may use compulsory and optional routines at their discretion in the training of young gymnasts. In the vaulting events, gymnasts sprint down a 25 meter (about 82 feet) runway, jump onto a springboard and onto the vault in a straight body position, touching the vault with their hands and blocking off it. Beginners will often be upright; more advanced gymnasts will block off from a handstand position and spring to their feet. The dismount may include one or multiple saltos and twists. In 2001 the traditional vault was replaced with a new one, sometimes known as a tongue or table. The new apparatus is more stable and safer than the old one, giving gymnasts a larger blocking surface. It is also longer–approx. 1m in length and 1m in width. With the addition of this new, safer vault, gymnasts are now completing far more difficult and dangerous vaults. On the uneven bars (also known as asymmetric bars, UK), the gymnast navigates two horizontal bars set at different heights. The height is generally fixed, but the width may be adjusted. Gymnasts perform swinging, circling, transitional, and release moves, as well as handstands. Usually in higher levels of gymnastics, leather grips are worn to ensure that the gymnast maintains a grip on the bar, and to protect the hands from blisters and tears (known as rips). Gymnasts sometimes wet their grips with water from a spray bottle and then may apply chalk to their grips to prevent the hands from slipping. Chalk may also be applied to the bar or to the hands if grips are not worn. The most common way to mount the uneven bars is by using a springboard and jumping towards the lower bar. The gymnast performs a choreographed routine from 60 to 80 seconds in length consisting of leaps, acrobatic skills, turns and dance elements on a padded sprung beam. Apparatus norms set by the International Gymnastics Federation (used for Olympic and most elite competitions) specify the beam must be 125 cm (4' 1") high, 500 cm (16' 5") long, and 10 cm (4") wide. The event requires in particular, balance, flexibility and strength. Gymnasts perform a choreographed exercise 70 to 90 seconds long. The music is instrumental and cannot have vocals. The routines consist of tumbling passes, series of jumps, dance elements, acrobatic skills, and turns. The exercise is performed on a carpeted, spring floor, 12 m x 12 m. A gymnast has three or four tumbling passes that include three or more tricks. At the compulsory levels gymnasts are judged on a scale of 10, but as they reach the higher levels, particularly levels 9 and 10, the gymnasts' start-values may vary depending upon a number of different factors such as skill level and skill combinations. Also, every skill has a letter grade describing its difficulty. At level nine, to reach a start value of ten, the gymnast has to acquire bonus points, which she can achieve by connecting two or more skills of a certain level of difficulty. Compulsory levels of gymnastics have choreographed routines, and all women competing at that level do the same routines. Compulsory levels go from 1-6; most gymnasts start at levels 2-4. Optional levels, however, are all different and have different floor music. Optional levels are 7-10 (elite). The Olympics and college level gymnastics are also optional. In the Olympics, gymnasts compete at elite, which is higher than Level 10. The floor event occurs on a carpeted 12m × 12m square, usually consisting of hard foam over a layer of plywood, which is supported by springs or foam blocks. This provides a firm surface that will respond with force when compressed, allowing gymnasts to achieve extra height and a softer landing than would be possible on a regular floor. A series of tumbling passes are performed to demonstrate flexibility, strength, and balance tests. The gymnast must also show non-acrobatic skills, including circles, scales, and presses. Men's floor routines usually have four passes that will total between 60–70 seconds and are performed without music, unlike the women's event. Rules require that gymnasts touch each corner of the floor at least once during their routine. The ultimate balancing act, gymnasts must perform continuous circular movements around the horse while allowing only their hands to actually touch it. This is considered one of the most difficult of the men's events and requires flawless control of balance and body position. Still Rings is arguably the most physically demanding event. The rings are suspended on wire cable from a point 5.75 meters off the floor, and adjusted in height so the gymnast has room to hang freely and swing. He must perform a routine demonstrating balance, strength, power, and dynamic motion while preventing the rings themselves from swinging. At least one static strength move is required, but some gymnasts may include two or three. A routine must begin with an impressive mount, and must conclude with an equally impressive dismount. Gymnasts sprint down a runway, which is a maximum of 25 meters in length, before hurdling onto a spring board. The body position is maintained while "punching" (blocking using only a shoulder movement) the vaulting platform. The gymnast then rotates to a standing position. In advanced gymnastics, multiple twists and somersaults may be added before landing. Successful vaults depend on the speed of the run, the length of the hurdle, the power and strength the gymnast has in the legs and arms and shoulder girdle, the kinesthetic awareness in the air, and the speed of rotation in the case of more difficult and complex vaults. Men hold themselves on two bars slightly further than a shoulder's width apart and usually 1.75m high while performing a series of swings, balances, and releases that require great strength and coordination. A 2.4cm thick steel bar raised 2.5m above the landing area is all the gymnast has to hold onto as he performs giants (body revolutions around the bar), release skills, twists, and changes of direction. By using all of the momentum from giants and then releasing at the proper point, enough height can be achieved for spectacular dismounts, such as a triple-back salto. Leather grips are usually used to help maintain a grip on the bar. As with the women, male gymnasts are also judged on all of their events, through performance and presentation. The discipline of rhythmic gymnastics is currently only competed by women (although there is a new version of this discipline for men being pioneered in Japan, see Men's rhythmic gymnastics), and involves the performance of five separate routines with the use of five apparatus—ball, ribbon, hoop, clubs, rope—on a floor area, with a much greater emphasis on the aesthetic rather than the acrobatic. Rhythmic routines are scored out of a possible 20 points, and the music used by the gymnast can contain vocals, but may not contain words. Aerobic gymnastics (formally Sport Aerobics} involves the performance of routines by individuals, pairs, trios or groups up to 6 people, emphasizing strength, flexibility, and aerobic fitness rather than acrobatic or balance skills. Routines are performed on a small floor area and generally last 60-90 seconds. Trampolining consists of four events: individual, synchronized, double mini and trampoline. Only individual trampoline is included in the Olympics. Individual routines involve a build-up phase during which the gymnast jumps repeatedly to achieve height, followed by a sequence of ten leaps without pauses during which the gymnast performs a sequence of aerial tumbling skills. Routines are marked out of a maximum score of 10 points. Additional points (with no maximum) can be earned depending on the difficulty of the moves. Synchronized trampoline is similar except that both competitors must perform the routine together and marks are awarded for synchronicity as well as the form of the moves. Double mini trampoline involves a smaller trampoline with a run-up, two moves are performed and the scores marked in a similar manner to individual trampoline. Acrobatic Gymnastics (formerly Sports Acrobatics), often referred to as acrobatics, "acro" sports or simply sports acro, is a group gymnastic discipline for both men and women. Acrobats in groups of two, three and four perform routines with the heads, hands and feet of their partners. They may pick their own music, but lyrics or Disney music are not allowed. Performers must compete in preparatory grades A and B, then move on to grades 1, 2, 3, 4 and 5; by 3, 4 and 5 two routines are required, one for balances and another for tempos. Generally, competitors climbed either a 6m (6.1m = 20 ft in USA) or an 8m (7.6m = 25 ft in USA), 38mm (1.5") diameter natural fiber rope for speed, starting from a seated position on the floor and using only the hands and arms. Kicking the legs in a kind of "stride" was normally permitted. Flying Rings was an event similar to Still Rings, but with the performer swinging back and forth while executing a series of stunts. It was a gymnastic event sanctioned by both the NCAA and the AAU until the early 1960s. Gymnastics is considered to be a dangerous sport, due in part to the height of the apparatus, the speed of the exercises, and the impact on competitors' joints, bones and muscles. In several cases, competitors have suffered serious, lasting injuries and paralysis after severe gymnastics-related accidents. For instance, in 1998, world-class Chinese artistic gymnast Sang Lan was paralyzed after falling on vault at the Goodwill Games. Artistic gymnastics injuries have been the subject of several international medical studies, and results have indicated that more than half of all elite-level participants may eventually develop chronic injuries. In the United States, injury rates range from a high 56 percent for high school gymnasts to 23 percent for club gymnasts. However, the rates for participants in recreational or lower-level gymnastics are lower than that of high-level competitors. Conditioning, secure training environments with mats and knowledgeable coaching can also lessen the frequency or occurrence of injuries. 10.0: The highest possible and most desired routine score for gymnasts to achieve on a single routine. In the past and perhaps in the future, at least for men’s gymnastics, scores may exceed 10.0 if they have a high degree of difficulty. Acro: Term referring to tumbling skill on beam or floor exercise, used most commonly when describing combination dance-acro requirements. Arabesque Penche: An arabesque scale in which the back is allowed to drop so that the rear leg may be raised higher. Artistic Gymnastics: The Olympic sport for men and women performed on apparatus and judged individually, by event, in the All-Around and by team. Men's events are floor exercise, horizontal bar, parallel bars, pommel horse, still rings and vault. Women's events are vault, uneven parallel bars balance beam and floor exercise. Assemblé: A common ballet and gymnastics movement where the legs are brought together in the air. Back Flip: One of a number of terms for a back somersault move that begins usually taking off two feet, rotates then lands again on the feet. Also called Back Somersault, Back Salto, Back Tuck, Back Pike, Back Layout. Bhardwaj: A salto on uneven bars named after Mohini Bhardwaj. She first performed the skill in International competition in 2004. It is done from a hang on the high bar, facing the low bar with a swing forward, and a layout salto backward with a full turn (360 degrees) between bars to a handstand on the low bar. Body Wave: A wave-like contraction movement of the entire body passing through the hips, shoulders, arms and head. Cartwheel: A gymnastics movement where the gymnast moves sideways (in the motion the wheel of a cart would follow) in a straight line alternately placing the hands and feet on the ground and finishing with the body coming up to a lunge landing position. The name cartwheel is so named because when a gymnast performs this, their arms and legs move like the spokes of a turning wheel. Crash dive: A trampoline skill where ¾ of a front somersault is performed landing in the back. Also called a suicide, but that term is not too popular with gym owners. Dismount: The term used for the last skill in a gymnastics routine. For most events the method used to get off of the event apparatus. Eagle Grip: In an eagle grip, a gymnasts hands are turned 180 degrees outward from a regular over grip. The hands and thumbs are turned out in the grip. This position requires a high degree of shoulder flexibility to swing comfortably and maintain a firm grip during the swing. Lunge: A position often used to initiate and/or land a tumbling or control skill like a cartwheel. The lunge position is recognizable because the front leg is bent and the back leg is straight. Maloney: An uneven bar skill named after Kristen Maloney. She first performed it in international competition in the 1997 World Championships. It consists of a pike sole circle backward to handstand with a 360° turn after the handstand phase to mixed-L or L grip. Plyometrics: Plyometric exercise is defined as a special type of strength training where the muscles are trained to rapidly contract. In gymnastics it is most commonly used to increase the “punch” power of a gymnast for tumbling and vaulting. Rhythmic Gymnastics: Officially called Rhythmic Sportive Gymnastics (RSG). An Olympic sport for either one woman or 5 women in group competition consisting of a floor exercise dance with leaps, turns, balance elements and flexibility moves while moving and tossing handheld apparatus: a ball, a rope, a hoop, two clubs, or a ribbon. Scissors Leap: (also called switch leap or a switch split leap) A leap in which the legs exchange positions while in the air, showing a split with both legs in one jump. Set: A set is a number of reps done without stopping. Usually referring to strength training, weightlifting or conditioning exercises. Undergrip: A term referring to the type of drip which gymnasts use on uneven bars or high bar. Hanging on a bar with your fingers facing you. Also called a reverse grip. ↑ Gymnastics Safety SafeUSA.org. Retrieved November 17, 2007. ↑ Gymnastics Glossary Gymnastics Zone Retrieved November 17, 2007.